This tasty weekend breakfast was made with left over tater tots ("Napoleon, give me some of your tots!") 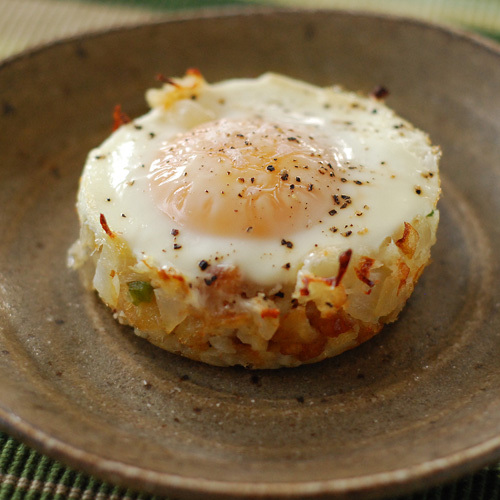 but you could easily subsititute leftover hash browns our country potatoes. Preheat a small skillet over medium high heat. Melt butter in the skillet and add the onion and jalapeno. Cook 3-5 minutes, stirring occasionally, until starting to soften. Add the garlic and cook another minute, stirring occasionally. Spray two small ramekin dishes with non-stick spray. Divide the crumbled tots between the two dishes. Stir the onion, chile, garlic mixture into the dishes. Top with the mozzarella. Crack an egg into each ramekin. Season with salt and pepper. Bake in the oven on the middle rack for 5 minutes. Broil on high for 5-6 minutes or until the eggs are set. Rest for 5 minutes before serving and warn diners that the ramekin is still hot. For a different plating, I like to slide the egg out of the ramekin with a fork or thin silicon spatula, as pictured..